Convert MXF to WMV, MXF to MP4, MXF to MPEG, MXF to AVI, etc. Besides converting MXF, the HD Video Converter can handle MTS/MOV/AVI camera shootings as well as HD TiVo recordings. Pavtube MXF MultiMixer is a powerful MXF converter, MXF multi audio track preserver and mixer. Pavtube MXF Converter is a smart tool specially designed for users to preview and convert MXF recordings to your wanted video and audio formats, so as to smoothly add them into Sony Vegas, Adobe Premiere, Windows Movie Maker, Magix Movie Edit Pro, Ulead DVD MovieFactory, Pinnacle Studio and more other video editing software to do further editing. With this MXF file converter, you are able to convert MXF to MPEG, encode MXF to WMV, transcode MXF to MP4, render MXF to AVI, and more. In addition, Pavtube MXF Converter(also considered as a Panasonic MXF Converter and a Canon MXF Converter) comes with optimized format presets for the most popular multimedia devices, such as iPad, iPad 3, Apple TV, ATV 3, PS3, PS Vita, Xbox 360, Motorola Xoom, HP Touchpad, Samusng Galaxy Tab, BlackBerry PlayBook, Kindle Fire, Nook tablet and so on. This MXF converter program helps you freely convert MXF recordings shot by a Panasonic P2 camcorder or a Canon XF camcorder for viewing on your different devices. If your editing software does not accept your MXF footage, you can use the MXF Converter to do to format conversion in the first place. This smart MXF conversion software is capable of converting MXF files for using in different video editing software, such as Sony Vegas, Avid, Adobe Premiere, Windows Movie Maker, Magix Movie Edit Pro, Ulead DVD MovieFactory and so on. 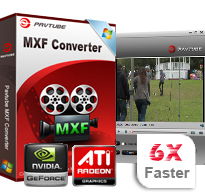 Pavtube MXF Converter takes full advantage of NVIDIA's CUDA technology and ATI Stream (AMD APP) technology to largely accelerate conversion speed. The GPU acceleration saves users lots of time when using H.264 codec to do format conversion. NOTE: To use GPU computing feature, a CUDA-compatible NVIDIA graphics card or an AMD graphics card with AMD APP technology must be installed. The CUDA and AMD APP acceleration both work only when creating H.264 encoded video files. Pavtube MXF Converter is able to encode MXF footage in Full HD quality to various other video formats with the original 1080p HD quality or down convert them to 720p/480p video. The output file types include MP4, MPG, MKV, MOV, WMV, AVI, VOB, M4V, etc. With Pavtube MXF Converter, you can encode MXF recordings for playback on various multimedia devices, including Apple Devices (e.g. Apple TV, iPad, iPhone, iPod), Android tablets (e.g. Motorola Xoom, Samsung Galaxy Tab, Acer Iconia Tab, HTC Flyer, Toshiba Thrive), Game Consoles (e.g. PS3, Xbox 360, Wii), HD Media Players(e.g. WD TV Player, Popcorn Hour Player, Seagate Player), Smartphones(Motorola Droid X, HTC Evo 4G, Samsung Galaxy S II), and more. This MXF Converter tool provides users with several simple editing functions, including "Crop", "Watermark", "Effect" and "Audio Replace". The "Crop" facility helps you cut off black edges and unwanted parts from the image. The "Watermark" facility allows you to add different watermark to the source file, such as text, image and video. The "Effect" function enables you to adjust brightness, contrast, and saturation, as well as add special effects to your source file. While the "Audio Replace" function allows you to replace the original audio track in your source MXF file with your specified soundtrack. With advanced audio and video in sync technology, Pavtube MXF Converter will keep you far away from audio and video out of sync issues. Sony Vegas Movie Studio/Pro, Adobe Premiere Express/Elements/Pro, After Effects, Encore, Avid Media Composer, Pinnacle Studio, Nero Vision, Roxio Creator, Windows Movie Maker, Magix Movie Edit Pro, Ulead DVD MovieFactory, etc. A: All of our products are platform-independent ones but not cross-platform. So a Windows product cannot be installed onto a Mac computer and vice versa. If you need a Mac version, please kindly contact with Pavtube support team at macsupport@pavtube.com. Or if you need a Windows version, please kindly contact with Pavtube support team at support@pavtube.com. Discount will be available for a second purchase. Q: My videos were recorded by HD camcorder, there are many stripes and noises on the picture after conversion, why should this happen? A: Some footage is taken under interlacing mode, and this lead to stripes and lines on the screen. To eliminate the lines, you may follow “Edit” -> “Effect” tab and check “Deinterlacing” box before conversion. As to the noise, when you apply the special effect mode “Simple Gauss Blur” from the drop-down list, the noise will be reduced greatly. A: Select the items you want to combine together and tick off “Merge into one file” before converting the videos. Q: My source videos (16x9) aren’t staying widescreen after conversion. I don’t want the video to be stretched and made taller. What can I do? A: After selecting an output format, click “Settings” button and set the Video Size to 1920*1080/ 1280*720/ 854*480/ 720*405. Q: I’d like to eliminate black bars (edges) from the video, what should I do? A: Click “Edit” button to enter into the edit panel and switch to the Crop tab, then just drag the crop frame on the video screen of the original preview window to cut off the unwanted parts. Q: Can I set larger volume? A: You can select an MXF file and then click the “Edit” button. Under the “Effect” tab, there is a “Volume” option. Drag the slider bar to a larger percentage. Click “OK” to save the settings. Then the output volume will be louder. - Added support to MXF trimming, including precise frame-by-frame trimming. - Batch importing of MXF video files from Panasonic P2 file structure.